BRICKFIELD residents welcomed the opening of the children’s playpark and outdoor gym which were recently installed at the Brickfield Recreation Ground. Couva North MP, Ramona Ramdial hosted a ceremony on Tuesday to officially open the park which was constructed by the Ministry of Works and Infrastructure’s (MOWI) Unemployment Relief Programme (URP) at a cost of $328,900. 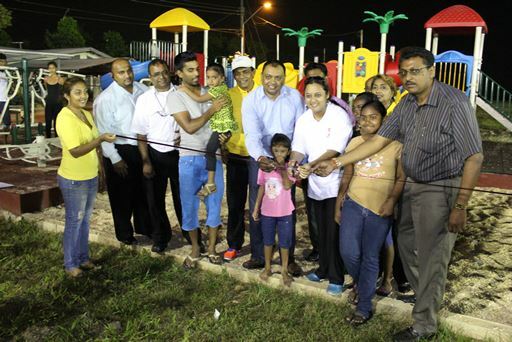 “Lights were installed on the Brickfield Ground in March 2014 and with this new playpark and gym, all members of the community from children to adults to the elderly would be able to participate in activities well into the night”, said Ramdial. She urged residents to take care of the playpark and not vandalize it, to be the watchdogs of their space and to ensure its sustainable use.